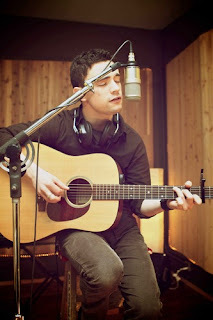 Joshua Hyslop is a singer/songwriter hailing from Abbotsford, BC. Joshua combines soothing guitar melodies with solid vocals that create a well rounded sound. He has released two albums, an EP in July of 2011 entitled "Cold Wind" and his first full length album, "Where the Mountain Meets the Valley", last month. Both works are structured quite similar and are quite the treat to listen to. "Cold Winds" is a six song EP filled with raw and simple songs that will please almost any ears. Sometimes, simple does not always work, but for Joshua it fits very nicely. The two songs that jump out at me are "Nowhere Left To Go" and "If I Was A Better Man". "Nowhere Left To go" was perhaps my favourite lyrically and was a very relaxing song that holds your interest throughout. "If I Was A Better Man" was a pleasant surprise and a great way to end the album. It was the most upbeat song on the album and for that reason, it stood out the most. It was almost as if the album was building up to this very song and this was the grand finale, and a grand finale it was. Excellent lyrics, incredible vocals and great instrumentals make not only this song, but this entire album worth a listen. "Where the Mountain Meets the Valley" is the first full length release from Joshua Hyslop. Right away it's as though he carried the energy that ended off his first album and carried it through this one. However, that is not to say that he didn't include any aspects from his first album as there are several softer songs on the album including "Time Alone", "First Light" and the title track "Where the Mountain Meets the Valley". Some of my favourites include "Wish You Well" and "Have You Heard?" because I feel as though these songs emphasise the evolution of Joshua's music, not to mention they are very sound both lyrically and instrumentally. If you liked "Cold Winds" you will definitely love "Where the Mountain Meets the Valley". Joshua Hyslop tends to keep his music simple but there is always something that gives his music a twist and makes for an enjoyable listen. Both his releases, "Cold Winds" and "Where the Mountain Meets the Valley" are very well done and chart his growth as an artist quite nicely. I recommend giving them both a listen, you will not be disappointed.